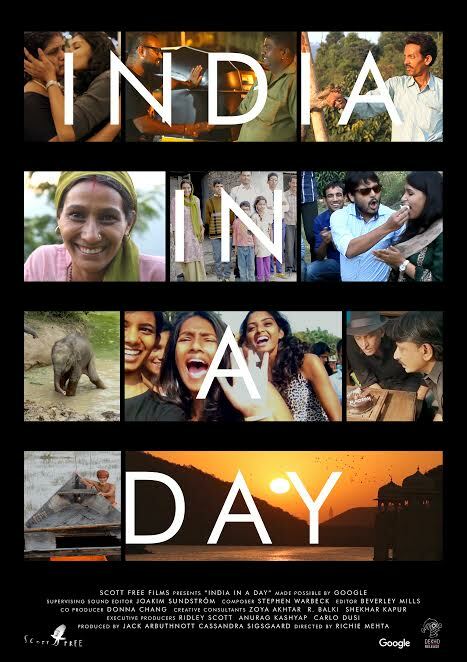 In a country captivated with cinema, INDIA IN A DAY directed by Richie Mehta and filmed by Indians across the country is all set to reach a larger audience, scheduled to release on September 23, 2016. This unique film will release in Delhi, Mumbai and Bangalore initially and was born out of a unique partnership between Ridley Scott’s Scott Free Films UK and Google. The film is crowd sourced, 90-minute feature-length documentary shot on a single day – October 10, 2015. Enlisted to capture a moment of the day on camera, thousands responded by submitting more than 16,000 videos, comprised of over 365 hours of deeply personal, heartfelt, and joyfully honest moments and insights. The footage submitted by participants was uploaded on a website set up by Scott Free Films and Google. This marks the first ever India film where footage has come from all over India; from Rajasthan to Kerala to the far-reaching Andaman and Nicobar Islands. The resulting film, which is India’s largest crowdsourced documentary, offers a remarkable insight into the lives, loves, fears and hopes of people living in India today. To enable this colossal project, director Richie Mehta reached out to noted Indian filmmaker Anurag Kashyap to help spread the word about the film as widely as possible. Additionally filmmakers Zoya Akhtar, R. Balki and Shekhar Kapur all gladly supported the project with call out videos and by spreading the word through social media. Having premiered at the Toronto International Film Festival 2016 and the Sheffield Festival 2016, this one of a kind film, saw Anurag Kashyap supervising a theatrical release in the country. Don’t miss out on watching this truly remarkable film in a theatre near you.